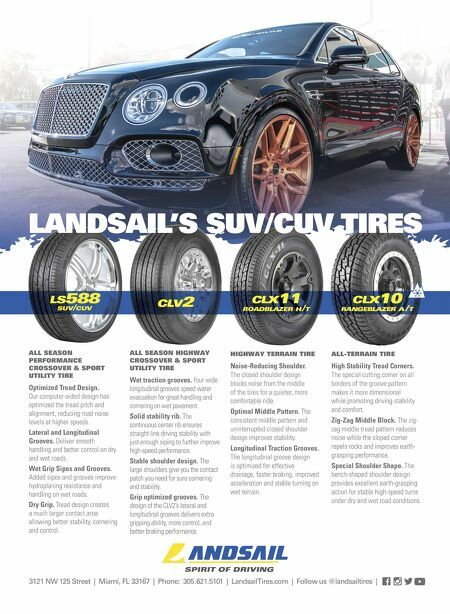 3121 NW 125 Street | Miami, FL 33167 | Phone: 305.621.5101 | LandsailTires.com | Follow us @landsailtires | CLV2 LS588 SUV/CUV LANDSAIL'S SUV/CUV TIRES ALL SEASON HIGHWAY CROSSOVER & SPORT UTILITY TIRE Wet traction grooves. Four wide longitudinal grooves speed water evacuation for great handling and cornering on wet pavement. Solid stability rib. The continuous center rib ensures straight-line driving stability with just enough siping to further improve high-speed performance. Stable shoulder design. The large shoulders give you the contact patch you need for sure cornering and stability. Grip optimized grooves. The design of the CLV2's lateral and longitudinal grooves delivers extra gripping ability, more control, and better braking performance. 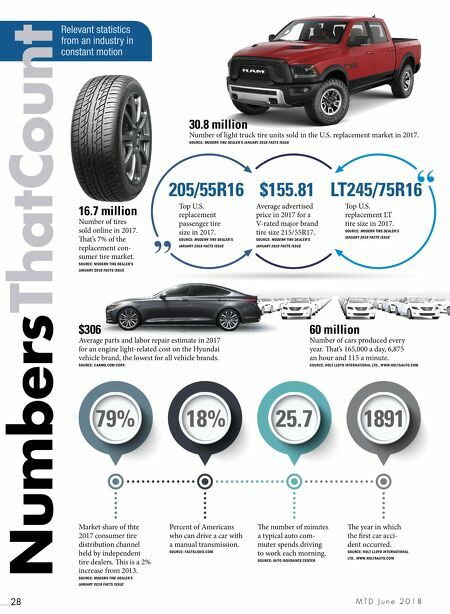 ALL SEASON PERFORMANCE CROSSOVER & SPORT UTILITY TIRE Optimized Tread Design. Our computer-aided design has optimized the tread pitch and alignment, reducing road noise levels at higher speeds. Lateral and Longitudinal Grooves. Deliver smooth handling and better control on dry and wet roads. Wet Grip Sipes and Grooves. Added sipes and grooves improve hydroplaning resistance and handling on wet roads. Dry Grip. Tread design creates a much larger contact area allowing better stability, cornering and control. CLX10 RANGEBLAZER A/T CLX11 ROADBLAZER H/T ALL-TERRAIN TIRE High Stability Tread Corners. The special cutting corner on all borders of the groove pattern makes it more dimensional while promoting driving stability and comfort. Zig-Zag Middle Block. The zig- zag middle tread pattern reduces noise while the sloped corner repels rocks and improves earth- grasping performance. Special Shoulder Shape. The bench-shaped shoulder design provides excellent earth-grasping action for stable high-speed turns under dry and wet road conditions. HIGHWAY TERRAIN TIRE Noise-Reducing Shoulder. The closed shoulder design blocks noise from the middle of the tires for a quieter, more comfortable ride. Optimal Middle Pattern. The consistent middle pattern and uninterrupted closed shoulder design improves stability. Longitudinal Traction Grooves. The longitudinal groove design is optimized for effective drainage, faster braking, improved acceleration and stable turning on wet terrain.